It's our last full day in London. We've seen most of the sights so we happened to be strolling around Trafalgar Square. We decided to walk down the Mall to the Palace again, and we could see something was up. There were baracades everywhere. We continued to walk, and then we saw a bunch of the Queen's Guards marching and forming a line on the street. We asked a police woman what the action was. 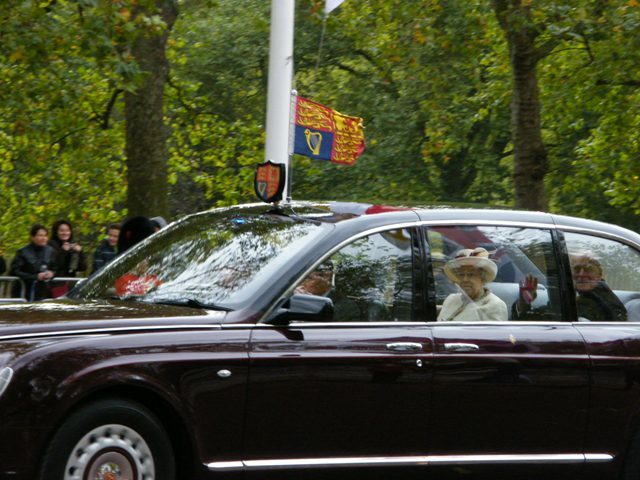 She was so friendly and told us the Queen would drive by. Within 10 minutes, a procession came along, and there they were. There were not too many on lookers. 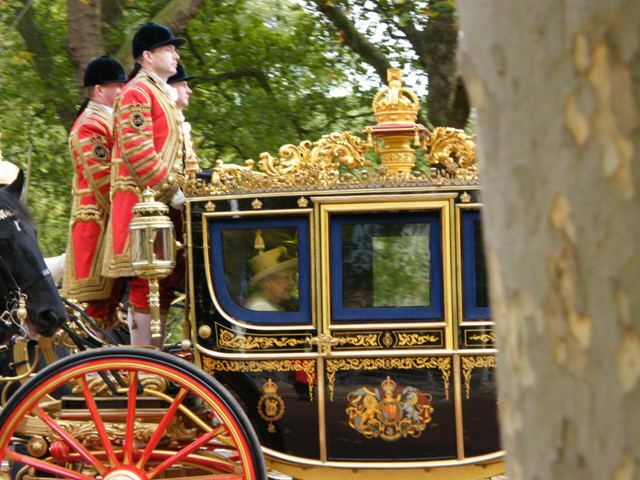 But look, Prince Phillip looked right at us, and waved for my camera. Yippee - what a great unexpected surprise and it made our day. Nice Horse..- moved slightly for my camera. We spent some time at Harrod's department store here in London. It was beautiful. I'll show you a few pictures. I didn't take pictures in the expensive jewelry part of the store. But trust me, it was all so beautiful and sparkly. 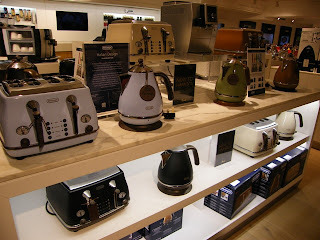 I got out my camera when we got to the kitchen section. Loved all the color of everything I saw there. New appliance colors. Light blue and Avocado Green! 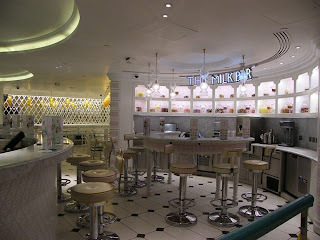 Other side of ice cream bar. 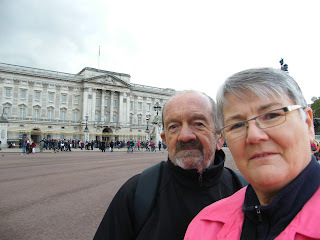 Mert & Gail at Buckingham Palace. We're day three of our week in London UK. 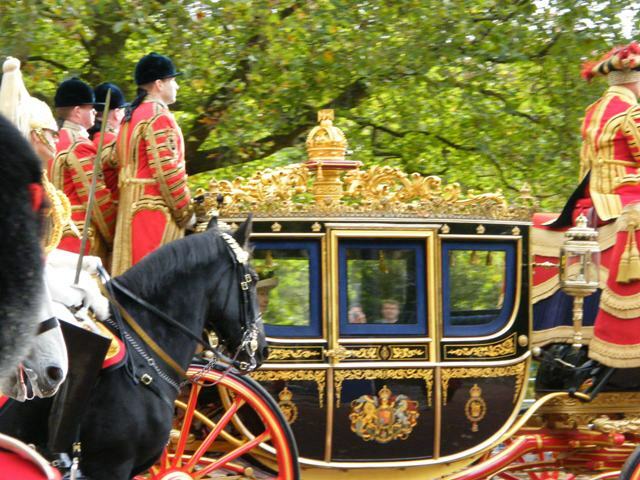 We've been criss crossing this city using the Tube and our 2 day hop on hop off double decker bus tour pass. We're experts at getting around now. We've seen most sights at least once, so we've made a list and are going back for second looks. Today, besides shopping at Harrods, and cruising down the River Themes, we saw the real Rosetta Stone and many other artifacts at the British Museum. 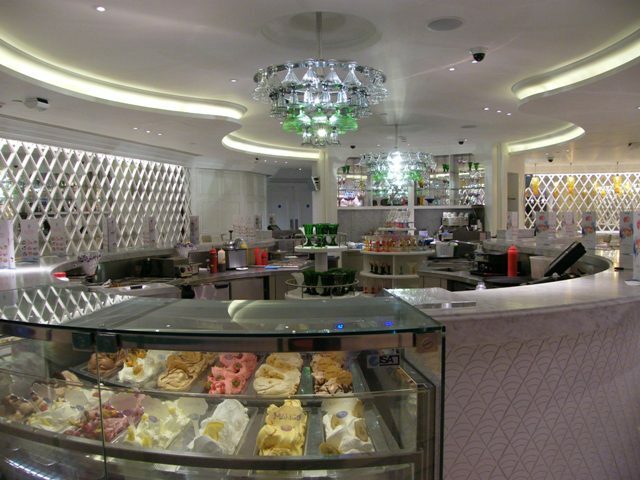 Tomorrow we are going to take a trip on the London Eye and do an inside tour of the Westminster Abby. We may squeeze a tour of Shakespeare's Globe Theatre tomorrow too. We're going on a trip soon. In thinking about the hours that we'll be in airports, and flying. 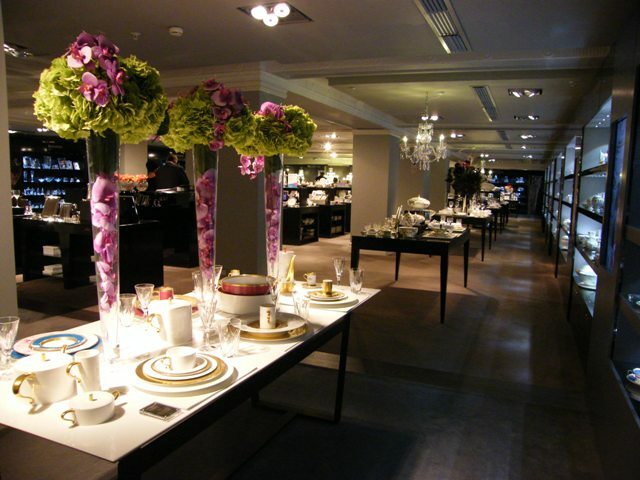 I need to bring a little something with me. I keep a little redwork project traced and ready to give as a gift to somebody who might be sick or in the hospital. The good news is, is that nobody has been sick lately, so I will take this little kit with me on my travels. It's a Meg CrabApple Hill pattern from 2002 called "Snow". I've given this little "Snow" project away as a "get well" gift a few times, but I've never actually stitched it up myself. So it's now in my embroidery travel pouch along with my red Sulky 12 wt thread, a hoop and my needle kit. I know that on our way back from our trip, we have a long connection wait in Montreal before getting home. So that's when most of this stitching will get done. 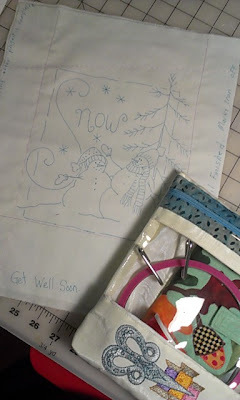 I'm going to try logging the hours it will take to stitch. I'm guessing between 6 and 8 hours. Let's see how close I am. I'm getting ready to go on a trip. 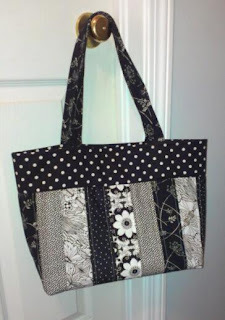 At our last guild workshop day, I started to make a Grommet Purse. 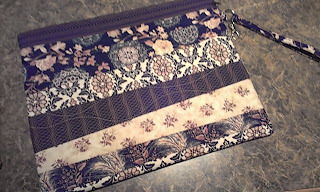 I got the purse half done during the workshop day, but got tired and said I'd finish when I got home. It's taken me two weeks to finally getat it and get it done. And Guess What... No grommets. I decided not to put them on after all. When thinking about my upcoming trip, I decided that a plain tote bag was needed. I like it... I might put some big pink or red buttons as an accent. Not sure.. we'll see. We were assigned a buddy guild in our province at the last Gathering of the Guilds conference this past spring. The Cotton Mill Guild was assigned the Miramichi Guild as a buddy guild. No rules.. We could do as we please. It was late in our guild year when we planned a day in the fall that we would invite them to come sew with us for a day. Well today was the day. We had 16 of their members come by the carloads this morning. We hosted them by giving them lots of yummy food, and providing a kit of fabric to each of them for a mystery project. The class was taught by one of our guild members Jennifer S.
The day is over, and it was a very satisfying day. I sat with a quilter named Jean from Miramichi. Everyone called her Mom! She was funny. Had a few "Worty Dirds", as she says.... tee hee.. Humor aside, she was an expert sewer and a nice table mate. The project everyone did is called the Style File. It was a great small project everyone learned a new zipper installation technique. Come to think of it, I think everyone finished their projects. The style file is a zipped portfolio that holds a letter sized file folder in the zipped part, and it will hold regular sized paper in the front pocket. 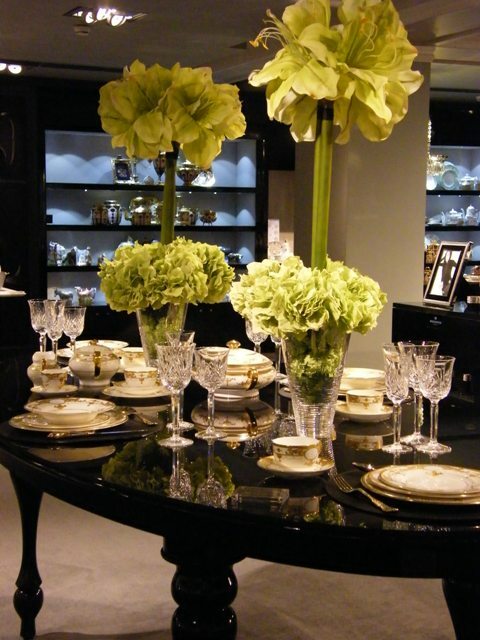 This a beautiful set of brown colors. The camera doesn't do it justice. Isn't it nice? Row of the Month - Rows 2 & 3 done. Two more rows done on our row of the month project that the guild has organized. So that's three in total that I have done now. I'm determined to keep up. If I don't, there's a risk that it will become a UFO. 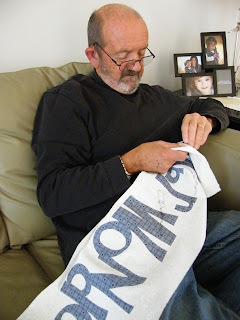 After my original blanket stitching from the Winter Wonderland row was unpicked earlier this week, I decided to use a small zig zag stitch to outline all the letters. It's not what you would call a satin stitch, but I do like it how it gives a nice definition to the outside of each of the letters. 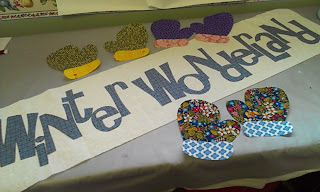 Thanks to a great suggestion from Sandra in a blogpost last week, I put a call out to my quilting buddies to see if they had any suitable blue for the background of my mittens row. Sure enough my friend Lee M. and Linda H. came to the rescue. I auditioned all the fabrics they pulled for me and Linda H., who is well known for her stash and love of blue fabrics, had the perfect one for me. I'm happy. Thanks girls for going through the effort of digging in your stash for me. It was much appreciated. 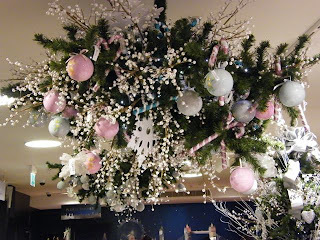 I'm not sure when we'll be given the next rows at guild, but I think it will only be after Christmas now. So till then, this project gets put away. Aurora was here this weekend with me. She had a bit of a fever and couldn't go to Daycare, so her mama brought her here on Friday. Grace came to stay the night with us and we watched a movie! Aurora was feeling a bit better on Saturday, so we went to Fabricville. 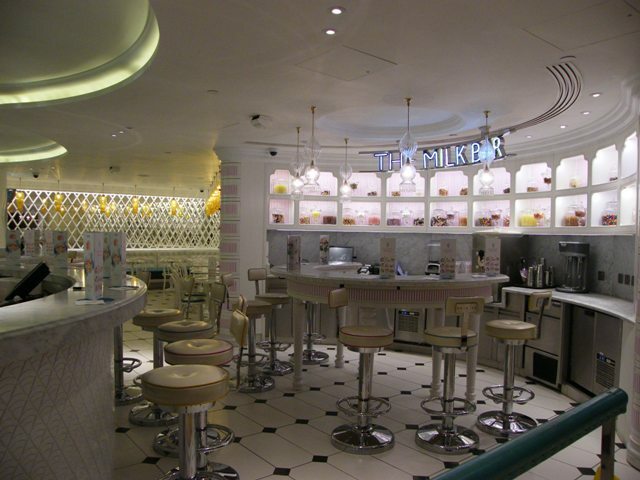 (Love that place). 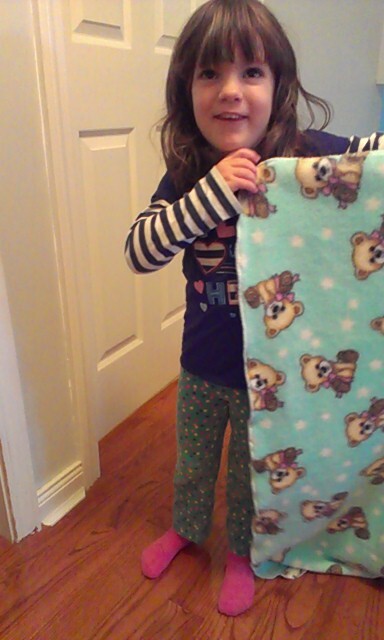 She picked out a piece of nice soft fabric to make her feel better. 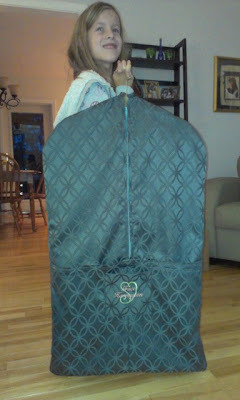 At the same time, I bought some fabric to make Grace a garment bag to carry all her dance costumes. 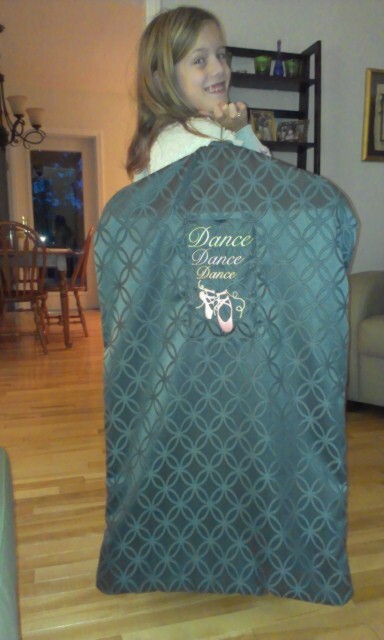 Grace designed what she wanted on her dance garment bag. Here was her design. She wanted "Dance Dance Dance" on it. 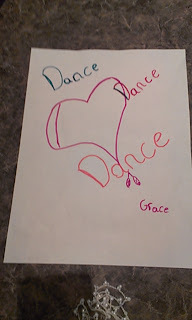 As well, as some ballet shoes, a heart and her name. So, I did some embroidery and made a nice bag with pockets for all her hair bows, scarves, shoes etc. Grace models the back of her garment bag! 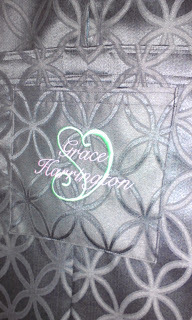 And the front with the heart and her name on the pocket. My sister calls these no bake cookies Frogs. This week she found the recipe and pinned it on Pinterest, I call them macaroons but after looking at the recipe a bit closer, I discovered that they are not the old fashion macaroons that am used to making. 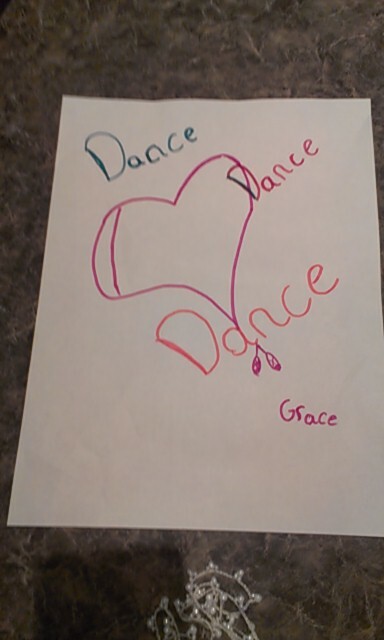 Grace's Dance team is having a fundraising bake sale tomorrow. 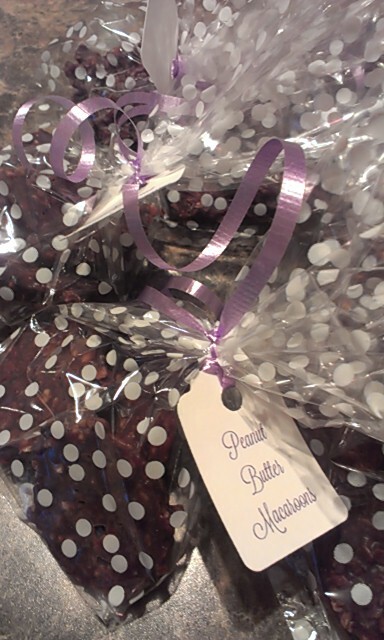 I thought I'd try this new recipe and package up for the fund-raiser. They taste like a Reeces peanut butter cup. 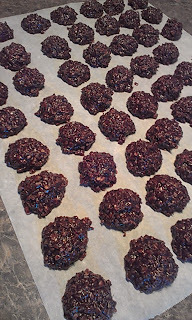 They are delicious and its a keeper recipe for me. I hope they make a bit of money for the team. PS: and here's what they look like all packaged up in cello bags. 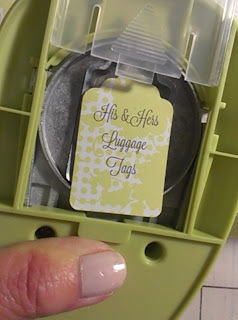 See my cute tag... that's twice this week that I've used this cutter.... I think it's going to get a lot of use. My blanket stitching from yesterday was just not coming out right. I guess I should have used a stabilizer. So after stitching a few letters, I decided it had to come out. I love my seam ripper. He's very efficient. In less than half an hour, he had all the little pieces of black thread picked out, and in the garbage. 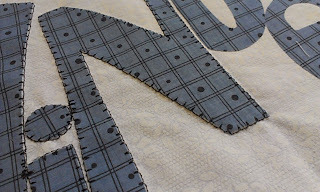 I'm about to start over...I think I will use a small zig zag instead of the blanket stitch around all those letters. 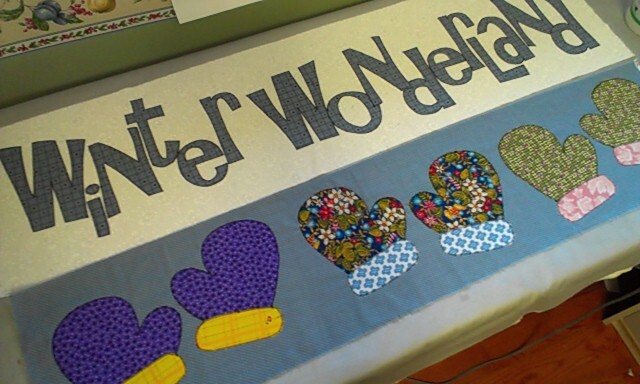 At the Cotton Mill Guild meeting yesterday, we were given instructions to do two more rows on our Winter Wonderland Row of the Month project. It's a really cute quilt, and I'm enjoying the group activity. 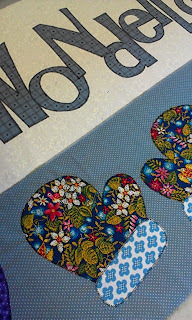 I'm sticking to my guns and using up only scrap fabrics. I don't do much machine blanket stitch applique so I'm learning how to do it as I go along on this Winter Wonderland row. For the mittens row, I'm to use a light blue background for the mittens. I'm struggling to find something from my stash that looks good. 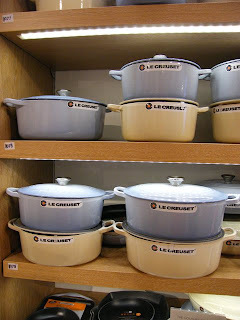 If I slip up on my "stash only" commitment it'll be to buy a piece of blue background. Holy cow. 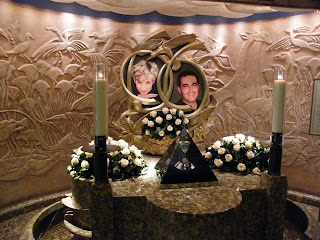 I just noticed it's been over a week since I blogged. I've been busy working on lots of projects. It's guild week. I have two meetings. On Tuesday, I'll be passing on small crafts to one of my quilt friends who is collecting crafts for a Grandmothers helping Grandmothers sale in November. 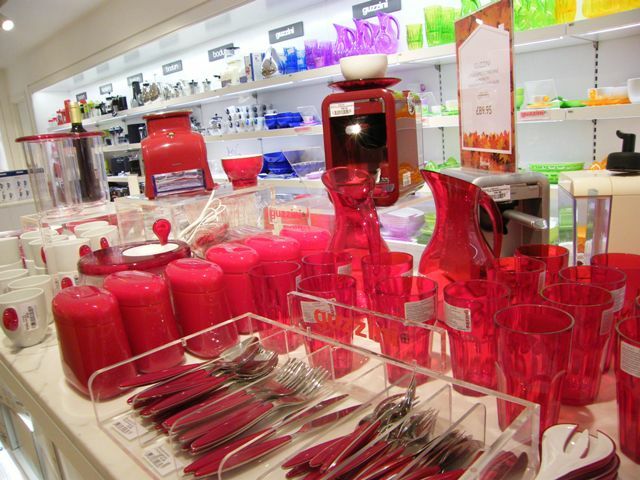 I thought I'd try to make them nice by putting tags on some of the items. 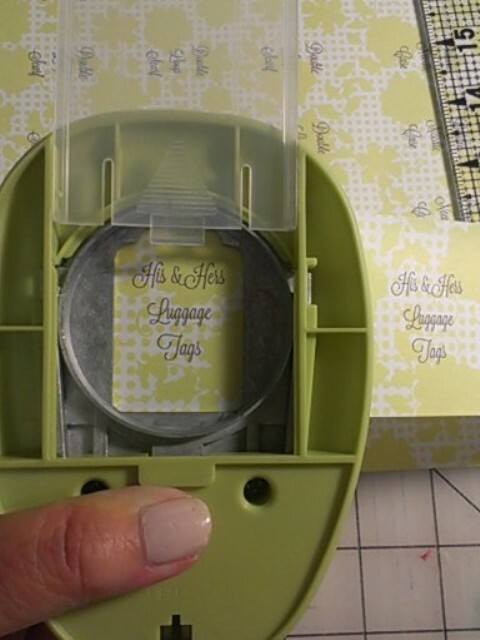 I don't do much in the way of paper crafts, but I did buy this punch recently at Michaels. 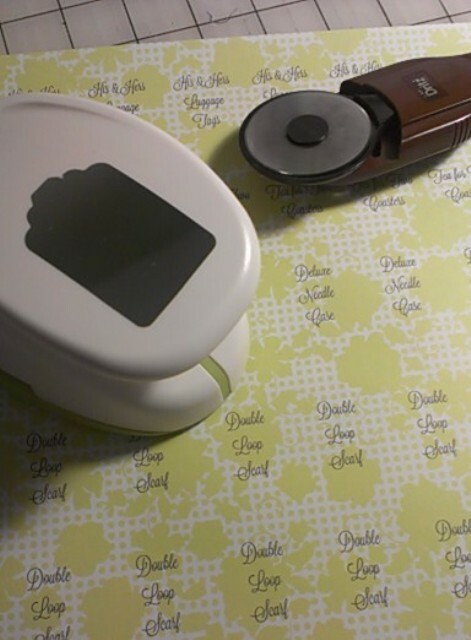 I think it will be nice to make paper labels for things from time to time. Here's my first attempt at using the punch today. 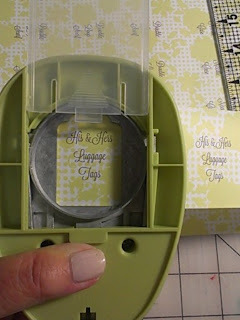 Turn tag punch over, and line up tag carefully. 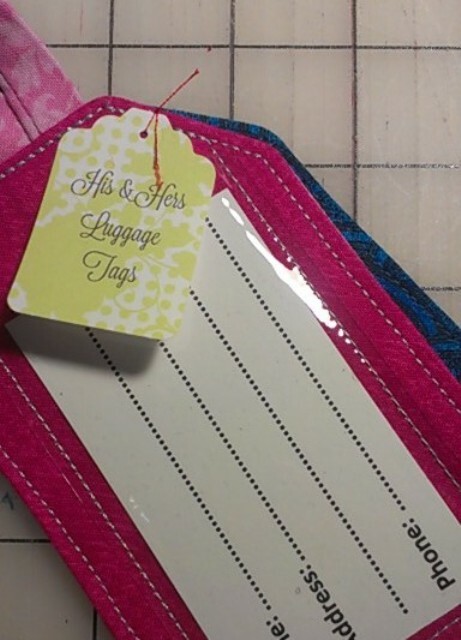 His and Hers Luggage tags. 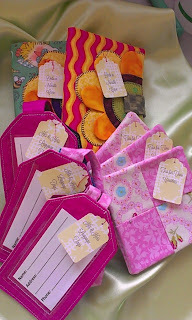 Needle Books, coasters, luggage tags. Of you see this sparkly nose at the old train station liquor store tomorrow, why not drop some change on her gymnastics fund raising bucket. Making small Items for a Craft Sale. I'm making and donating a few things for a crafty sale that the local chapter of Grandmothers helping Grandmothers is having in late November. 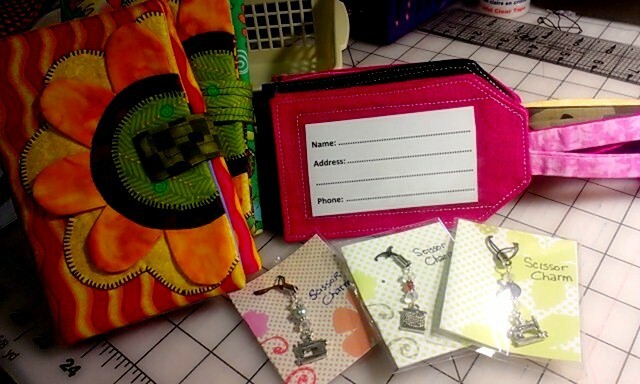 So far, I've made a few looped scarves, friggy fancy needle cases, some of our famous luggage tags (that Linda and I created the pattern for), and some blingy scissor charms for your little scissors. 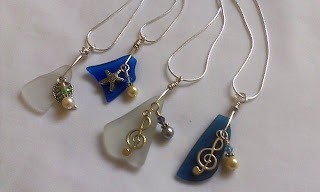 Aso, with some leftover jewelery making supplies from this year's Grammie Camp, it was fun to finish off these Beach Glass necklaces. A couple of these will also go to the Grandmothers craft sale too. Just in case you want to support Grandmothers by visiting this Craft Sale in later November, I'll find out more details about the date and location of the craft sale and post it.